President Donald Trump said he is recommending Herman Cain to the Federal Reserve Board, raising fears that the White House is seeking to reshape the central bank with political loyalists. Trump’s selection of Cain, a former pizza executive who ran for the 2012 Republican presidential nomination, for one of two vacant Fed seats follows his floating last month of another controversial nominee, Stephen Moore, a conservative economist and Fed critic. Moore advised Trump’s presidential campaign and is currently undergoing background checks. Trump has repeatedly criticized the Fed over its monetary policy, viewing its raising of interest rates as putting a brake on economic growth. Cain, the former chief executive of Godfather’s Pizza, has some prior experience at the Fed, having served as a director of the Federal Reserve Bank of Kansas City from 1992 to 1996. The Times said his views on monetary policy are “unorthodox,” noting that he called in 2012 for a return to the gold standard, which was abandoned in 1971. 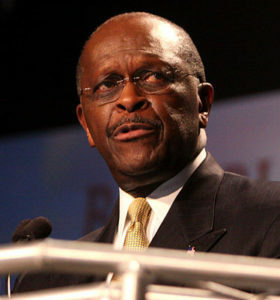 A Fed nominee requires Senate confirmation and Sen. Mitt Romney (R-Utah) signaled he is skeptical about Cain. “I would like to see nominees that are economists first and not partisans,” he told Politico. CNN reported that “any vetting process is likely to resurface” the sexual harassment allegations that forced Cain to drop his presidential bid. Photo: Gage Skidmore, CC BY-SA 3.0 U.S.